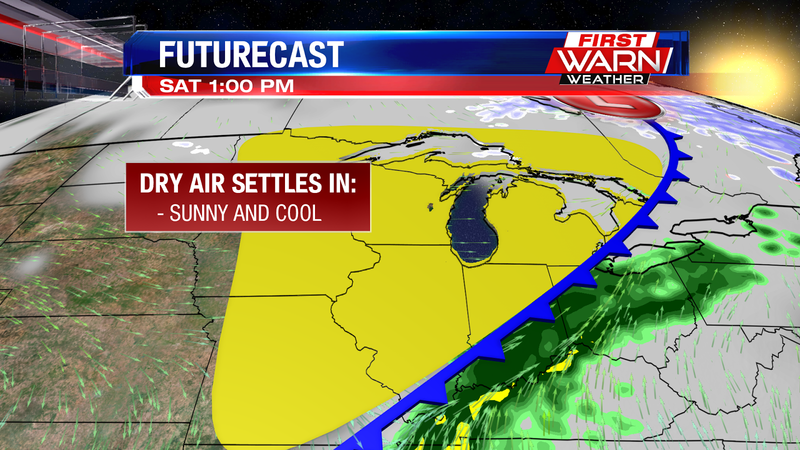 Snow showers are likely for the weekend as a cold front slides south through the Stateline Saturday evening. That front will help pull the jet stream down south through the center of the country early next week. 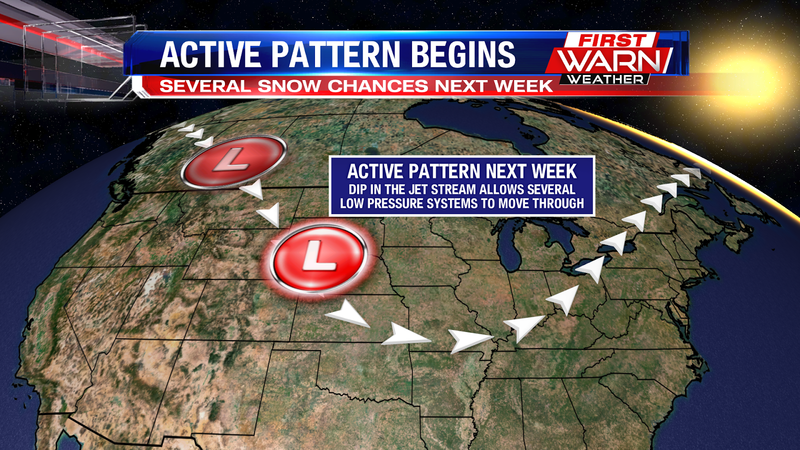 With the southward dip in the jet stream it will allow for several low pressure systems moving out of Canada to move down through Rockies, Plains and Midwest. These systems typically don't have a lot of moisture with them, but do increase the chance for snow almost every other day next week. The path of those low pressure systems depend on where exactly the jet stream and associated frontal boundary end up. If that boundary ends up a little further south of the Stateline, the snow threat will shift to the south. 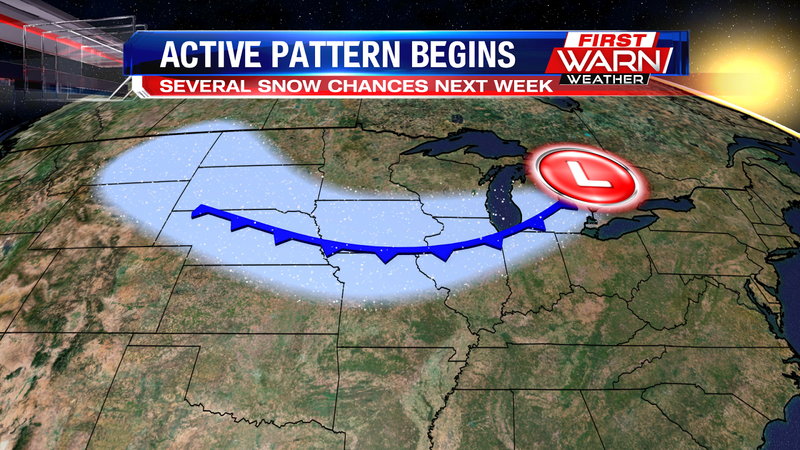 However, if the boundary lines up right over the Stateline we could quickly add up the snow by the end of next week. 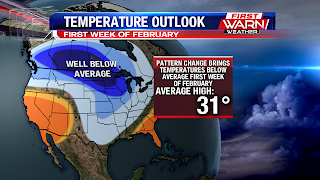 The dip in the jet stream will also keep below average temperatures around through at least the first week and a half of February. Despite a cold front passing and cloud cover Wednesday afternoon, high temperatures warmed into the low 40's, nearly 10 degrees above average. The air mass following the first cold front originated from the Pacific, which is why our temperatures were able to warm up. 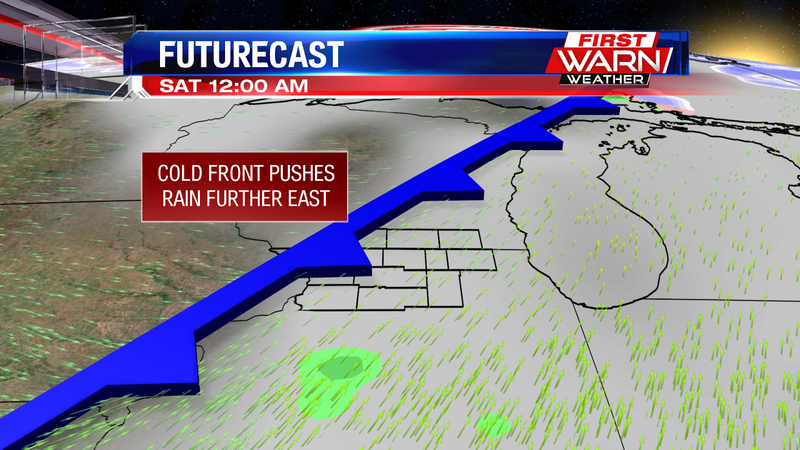 A second, and stronger cold front, will move in during the overnight. This front has origins from the Arctic and will be bringing down an Arctic air mass for the rest of the work week. Temperatures will hold steady in the low 30's Wednesday evening, only falling into the mid 20's overnight. It won't be until Thursday morning when temperatures tumble, falling around 20 degrees by sunrise and then falling even further into the teens for the rest of the day. 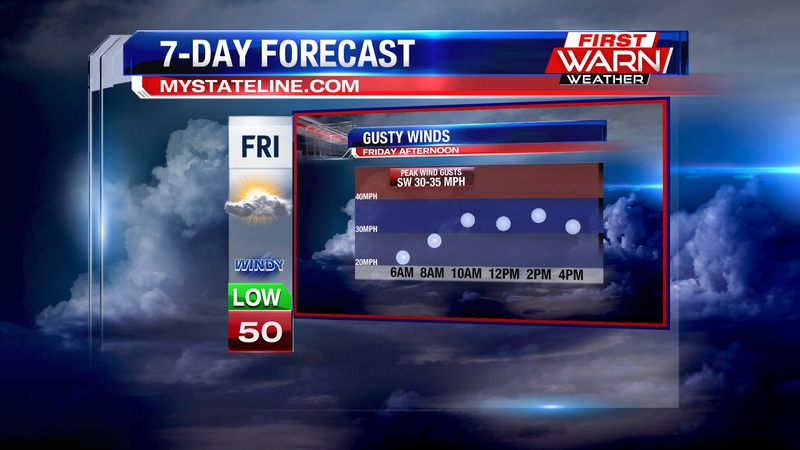 Winds will also increase Thursday, gusting up to 30mph during the day. 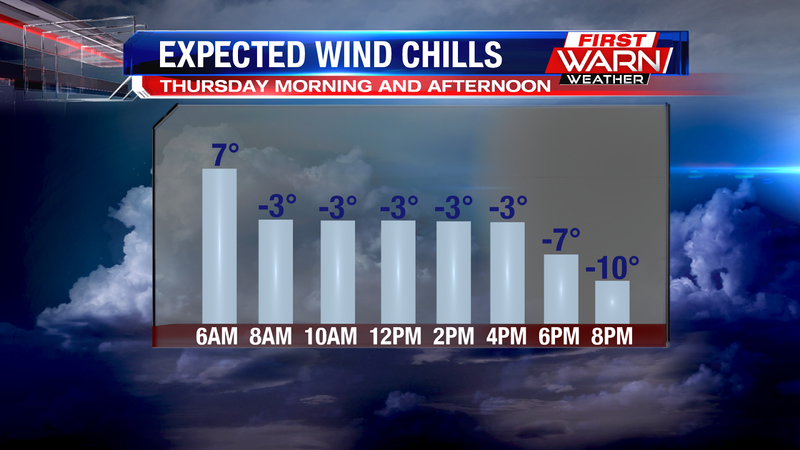 Wind chills will fall below zero by Thursday morning, and remain below zero throughout the afternoon. Winds will lighten up by Friday morning, but wind chills could still range anywhere from five to fifteen degrees below zero. It was an event over one hundred and fifty years in the making! 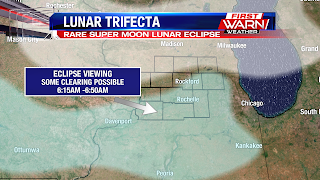 The last time we had this 'lunar trifecta' was back in 1866, just a year after the Civil War! 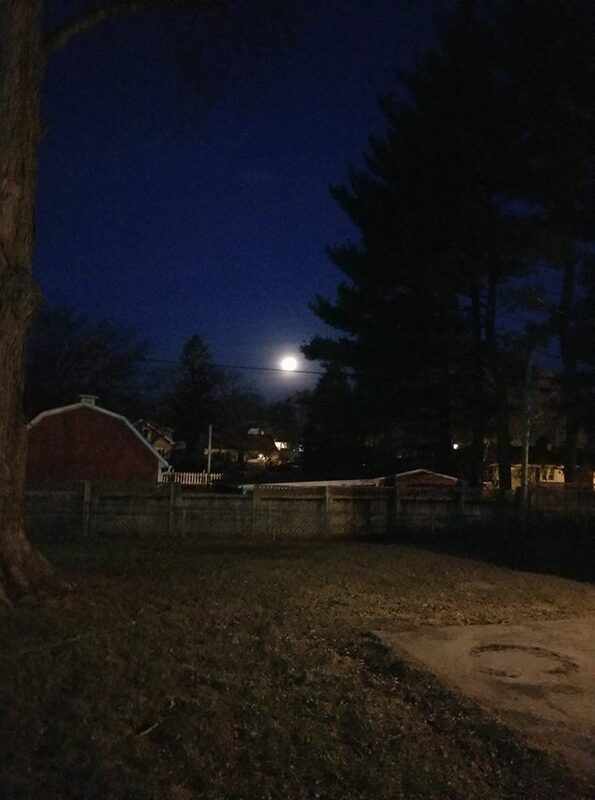 The super blue blood moon was a sight to be seen across most of the country, and thankfully skies cleared out early enough this morning for us across northern Illinois and southern Wisconsin to see it! 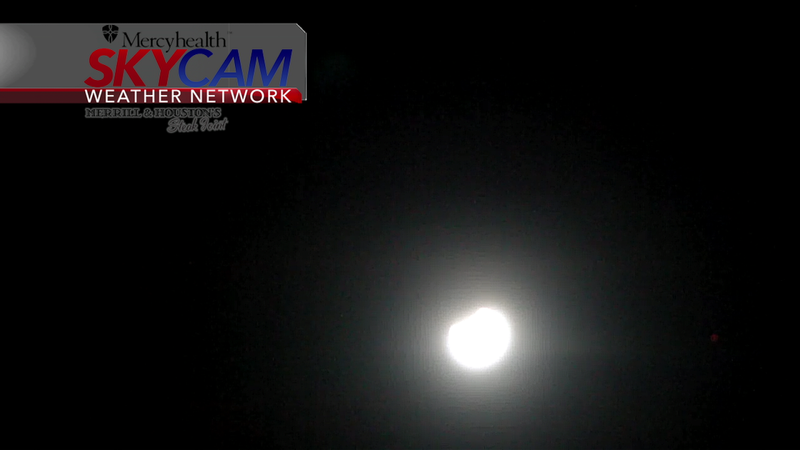 Here's a look at the very beginning of the eclipse from one of our Mercy Health Sky Cams in Beloit, WI. 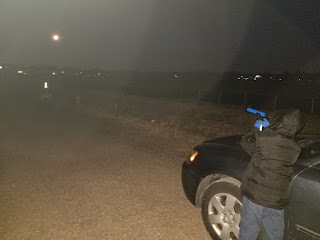 Below are some of your pictures! Thanks for sharing! Seems as if the snow has been hard to come by this winter season. Our highest snow came earlier in the month of January where totals ranged anywhere from three to five inches over northern Illinois. 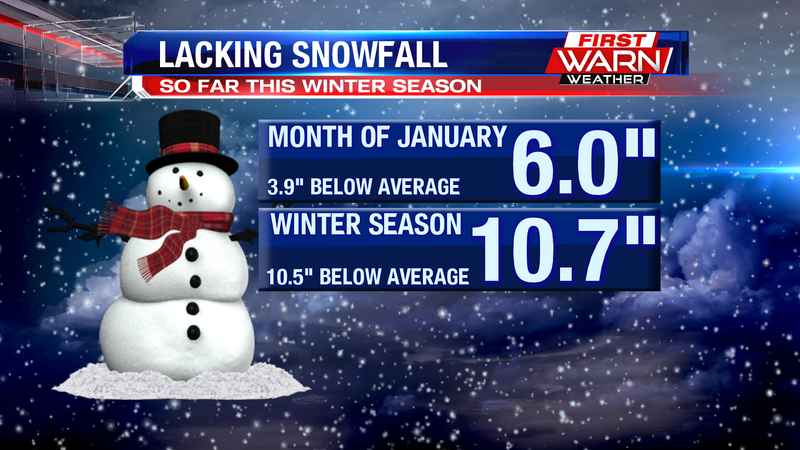 So far for the month of January we've only received six inches of snow, putting us at a three and a half inch deficit. 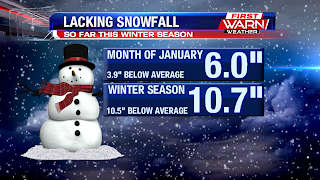 But when we look back to December 1st, which was the beginning of Meteorological Winter, we're at about a 10.5 inch deficit. The lack of precipitation and snow has had an impact on drought conditions over much of northwest Illinois and all of southern Wisconsin. 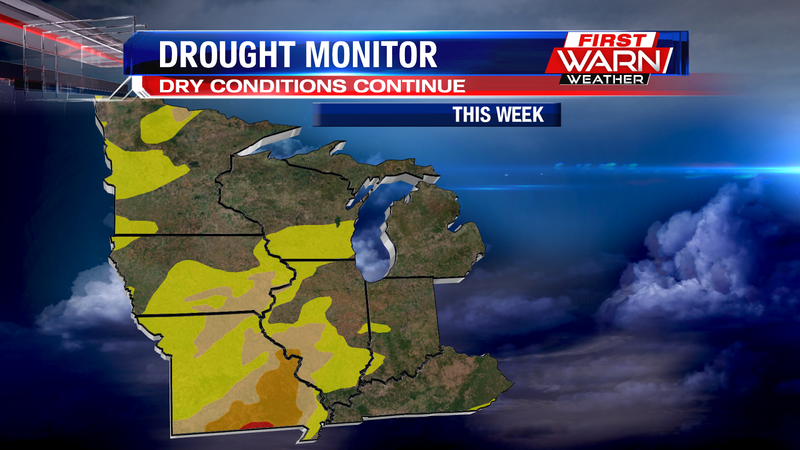 Many locations in the Midwest are reporting at least 'abnormally dry' conditions. While there is still plenty of winter left, the further we get into the month of February without any major accumulating snow, the harder it will be to make up our overall snowfall deficit for the winter season. There could be a few flurries that fly through the sky late Wednesday and early Thursday, but this weekend may actually hold a better chance for accumulating snow. While it's still too early to talk snow totals, the snow on Saturday could be enough to pull back out the shovel or snow plow. Everyone has been buzzing lately about the Lunar Trifecta that will take place in the early morning hours on Wednesday, January 31st. A rare event will take place, where there will be a blue moon, a blood moon, and a super moon at the same time. Separately, these events are rather common, but all together its pretty rare. A blue moon is described as the second full month within the month . 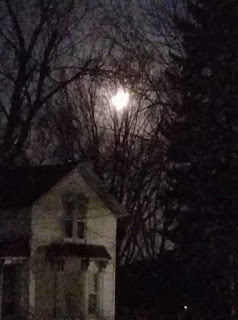 This moon is also the third super moon in a series of super moons. A super moon aprears 14% brighter than usual, as its the closest to Earth in its orbit. 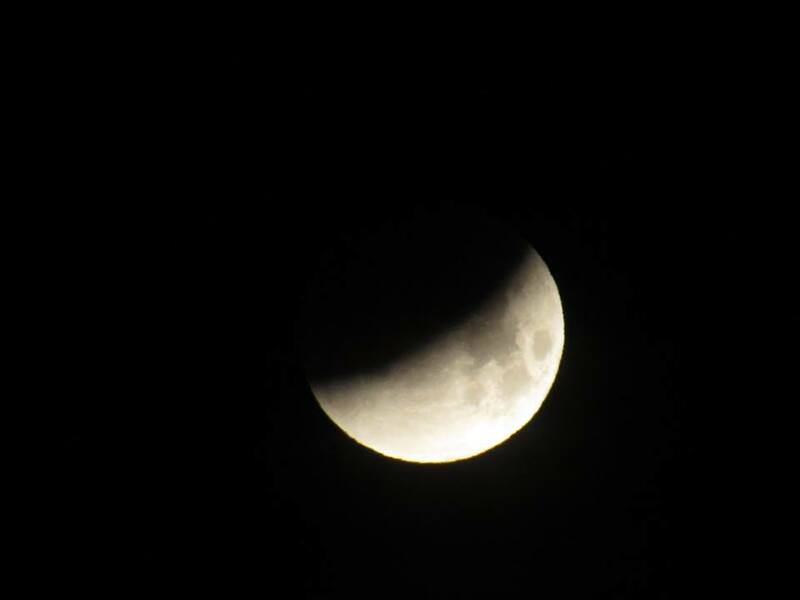 This super blue moon will then pass through the Earth's shadow creating a lunar eclipse; which gives the moon a reddish tint hence the blood moon. 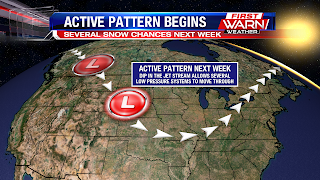 The Midwest would be under good viewing conditions if skies remained clear, however skies will begin to cloud up late Tuesday ahead of our next system. 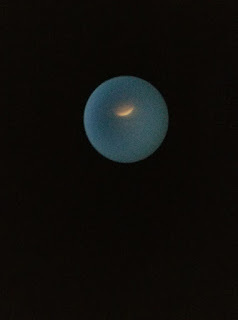 Obviously this would make for poor viewing conditions, but there is some good news in the cloud forecast. Looking up through the atmosphere, dry air will enter at the low to mid levels across the Stateline in the pre-dawn hours allowing for some clearing to take place. There will still be a few high level clouds, but the cloud forecast is definitely improving. 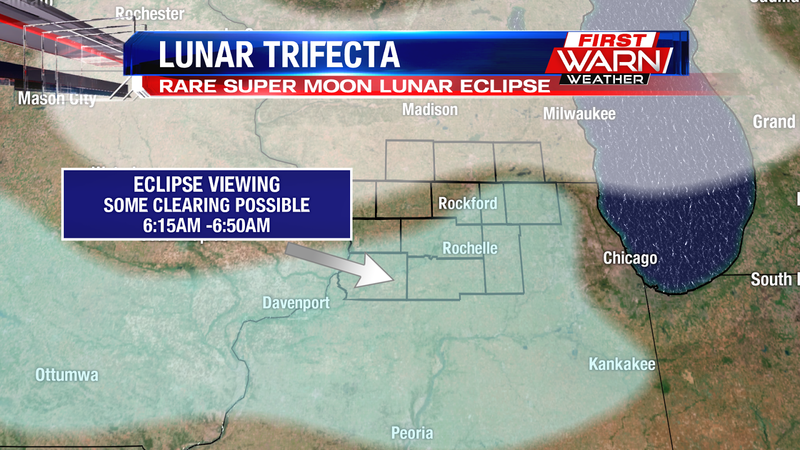 The area with a higher chance for clouds to clear would be near Rockford and into Boone and McHenry counties, and then south near the Quad Cities and near Peoria. 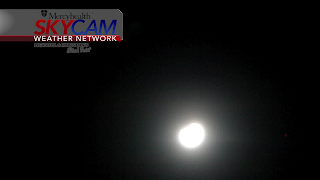 Or, if you happen to be in the southern half of the state, skies will be mainly clear. The best time to view the super blue blood moon will be around 6:15 through about 7am Wednesday morning. You'll want to look to the west! Incoming high pressure Monday evening will allow temperatures to drop down into the low teens and single digits by Tuesday morning. 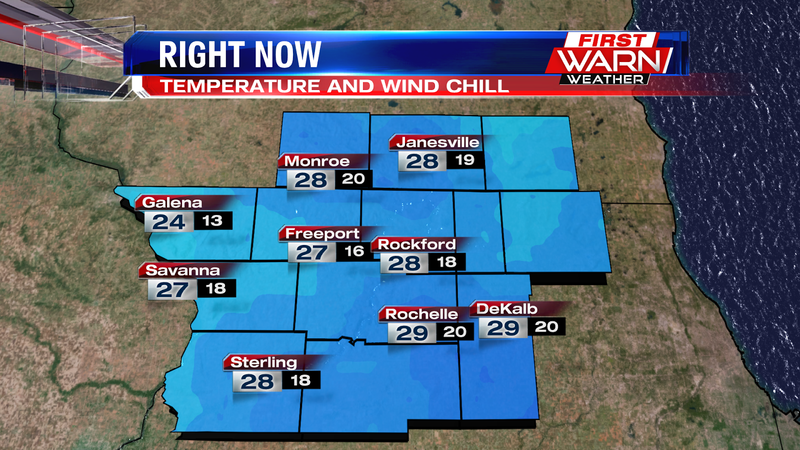 Winds will remain light through the morning, keeping wind chills above 0 degrees. By Tuesday afternoon high pressure will have moved into the Tennessee Valley allowing winds to switch around to the south over much of the Midwest. A warm front from an area of low pressure moving through Canada, will pass during the afternoon Tuesday. Clouds will be on the increase, but our skies should remain dry. Highs on Tuesday will reach close to 30 degrees, but remain mild Tuesday night as strong south winds help keep temperatures up through Wednesday morning. A cold front moves in Wednesday, crossing northern Illinois by Wednesday afternoon. Moisture remains limited ahead of the cold front as high pressure works to block most of it to the south. And by the time some of the Gulf moisture is pulled northward, the cold front will have already passed leaving us with only a slight chance for precipitation. 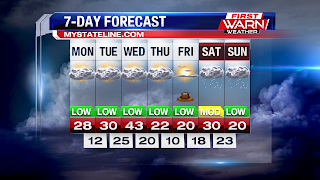 Temperatures on Wednesday will warm into the low 40's, before dropping into the 20's Wednesday night. 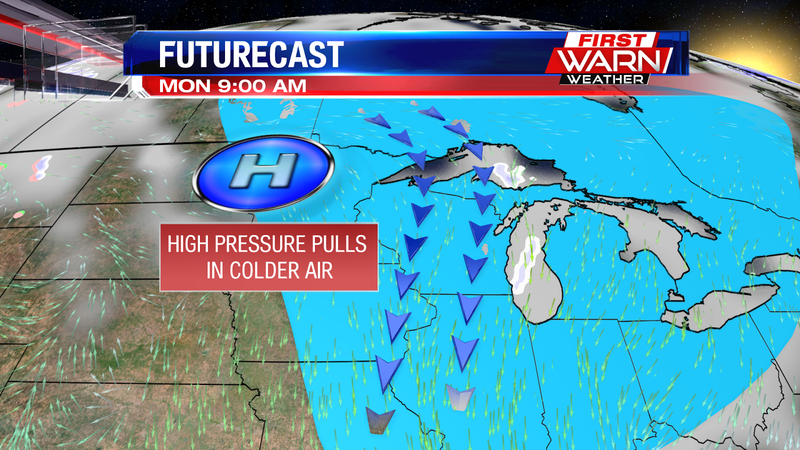 Cold air follows the front Thursday and Friday as high struggle to make it out of the low 20's. Another brief warm up arrives Saturday (and this one could bring some snow), followed by another cold blast early next week. What a difference a week makes! 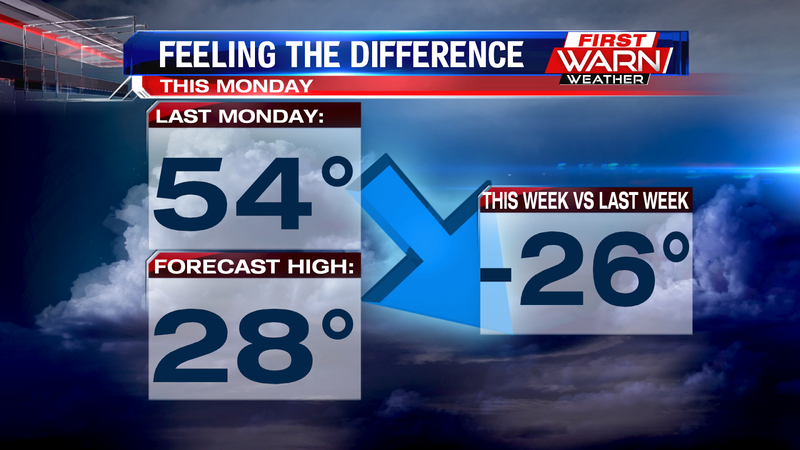 There is quite a measurable change from high temperatures last week compared to this week. Last Monday featured about an inch of rain and thunderstorms, and highs that climbed into the low 50's. Rockford's official high was 54°, but the pattern aloft has been changing. Through late Sunday and into Monday, a steep upper trough or dip in the jet stream is helping to tug in colder Canadian air. Behind the cold front, highs today will only climb a few degrees today into the upper 20's. The forecast high of 28° is 26° colder compared to last week's high. 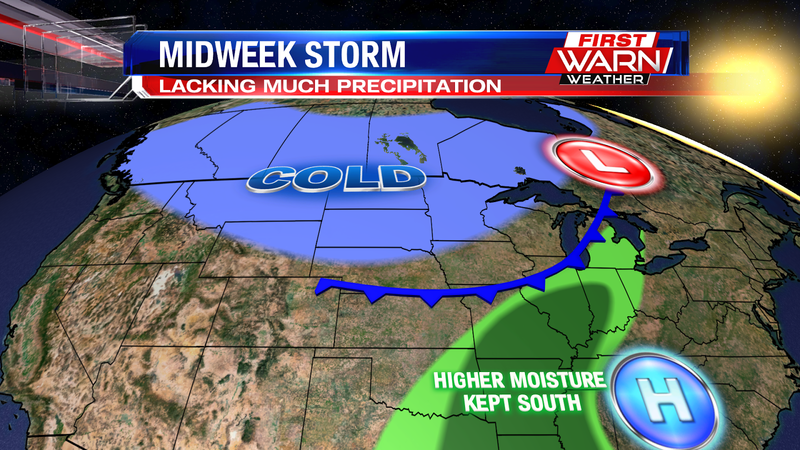 There is another small warm up this week, by midweek highs will climb into the 40's. Unfortunately that won't last, temperatures will fall back into the 30's and 20's by the end of the week. As a cold front moved through southern Wisconsin and northern Illinois Sunday afternoon, scattered snow flurries began to fall. Light snow has been falling further north in Wisconsin with snow totals so far ranging from half an inch, up to over an inch from near Madison to Waukesha. Scattered flurries will continue Sunday evening, especially for locations near the Wisconsin/Illinois border, while light snow will continue over south-central and southeast Wisconsin. Some of the those snow showers will begin to rotate back west through the evening and overnight, before coming to an end by Monday morning. Any accumulating snowfall is expected to remain over Wisconsin through Monday. A light dusting of snow is possible over north-central and northeast Illinois Sunday evening. You can't ask for a better start to the weekend, as temperatures hit the mid 40's this afternoon under sunny skies! 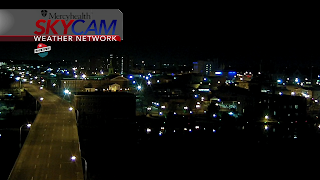 The evening stays fairly nice as well, with temperatures in the mid 30's while keeping the clear skies. 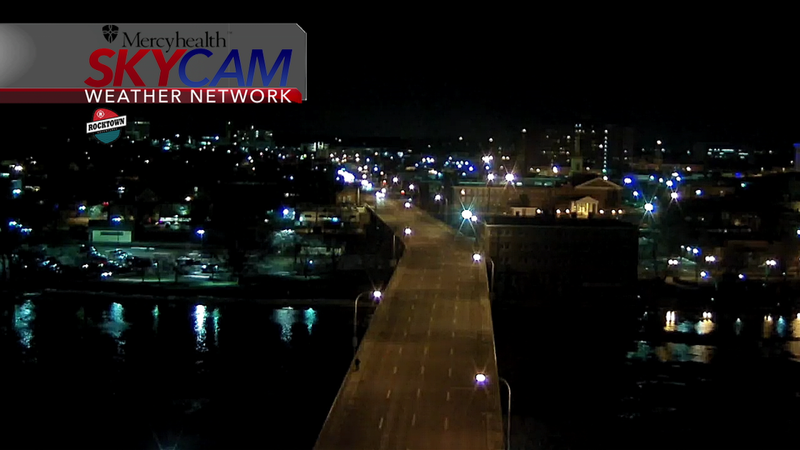 Skies stay clear into the overnight, where temperatures will eventually dip into the mid 20's. There is some rain moving towards us out west, but this will fizzle out before reaching us as our atmosphere is too dry. 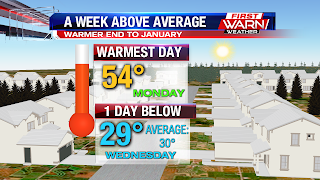 Not only did we have a warm start to the weekend, but this has been a very warm week in general for January. We started the work week in the mid 50's, staying above average for almost the entire week. The only day we didn't get above average was on Wednesday, only hitting one degree below it. Our average is 30° for this time of year. Sadly, today was the last day of warmer temperatures for a while, as a couple systems move through this coming week to keep us on the colder side. As we head into Sunday, a mid-level trough will move over our area. Clouds will start building by 6am, but scattered flurries are expected to move in around 9am. These stay with us into the later hours of the evening, and the northerly winds and cloudy conditions will only allow temperatures to only hit the low 30's Sunday afternoon. 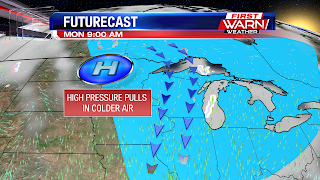 After that mid-level trough moves out Sunday night, high pressure moves in from the north to pull the cold air back into our area. This will keep temperatures in the 20's for most of next week, with Wednesday being the only day we get into the low 40's. However, even though it'll be a colder week, we're also expecting plenty of sunshine throughout the week as well. We had some warmer temperatures to end the work week, but sadly only got to see sunshine right before the sun went down. Depending on where you live you either experienced isolated rain, or cloudy and breezy conditions. We keep the breezy conditions for the rest of the night, but luckily this will actually help keep our temperatures a little warmer during the overnight. 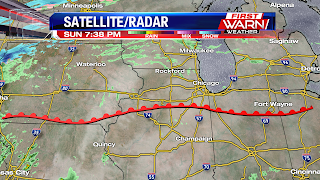 We've got a cold front moving in from the west that'll bring some light rain over the western portion of our viewing area around 9pm. 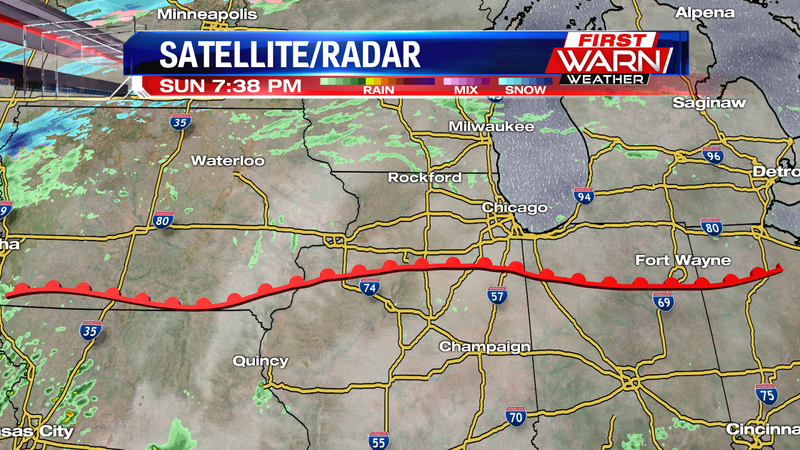 The front will slowly push eastward during the overnight, bringing the light rain everywhere else. By the time we reach 6am tomorrow morning there will a few spots of lingering rain out east, but other than that we'll start to see the skies clear up as dry, mild air moves in from the west. This will stay clear for the rest of the day, with temperatures hitting the mid 40's during the afternoon. 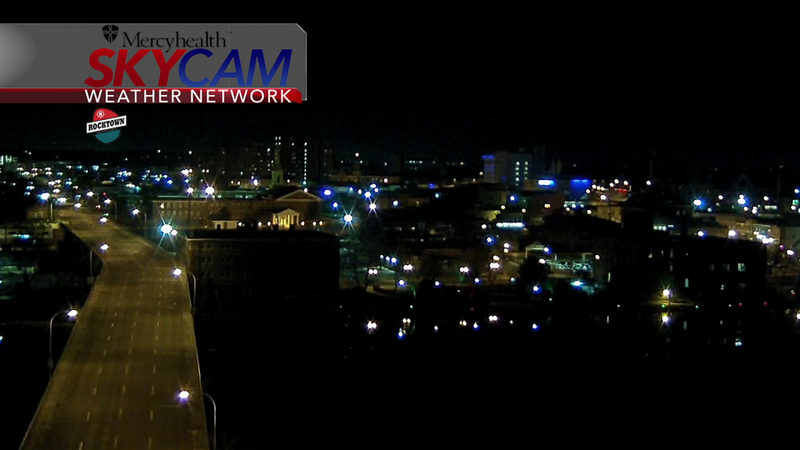 The clear skies stay with us through the overnight Saturday night. Unfortunately, the cold will return to our area by the end of the weekend, as high pressure moves down from the north to push colder air into our area. 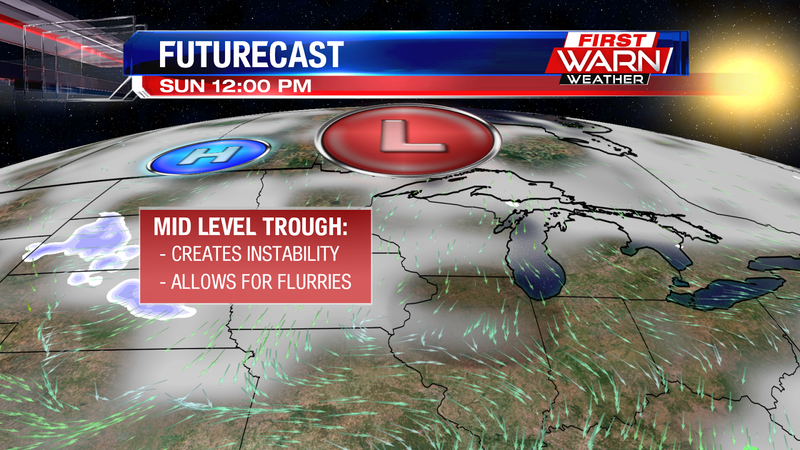 A mid-level trough will also move through on Sunday, bringing us chances for light snow Sunday afternoon. 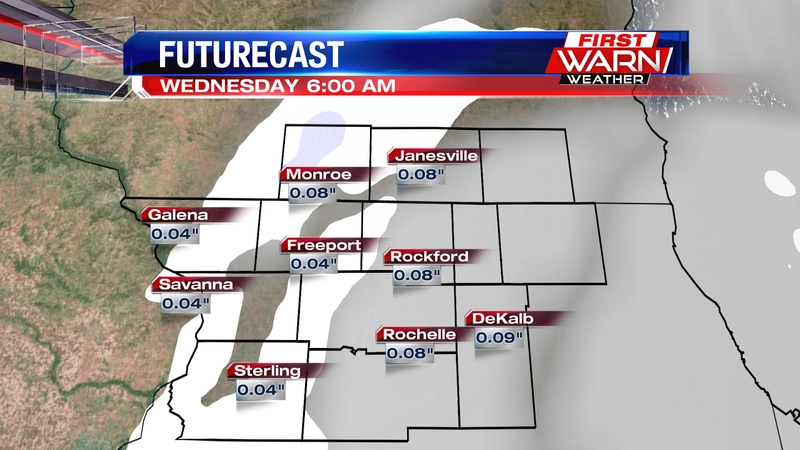 Accumulations are expected to be very small. As we head into the work week that mid-level trough will linger, so we can't rule out a quick light snow shower on Monday. The trough moves out on Tuesday, after which we'll stay in the low 30's for most of the week, with Wednesday looking to be the only day where temperatures are warmer around 40°. It's been a roller coaster ride this week in terms of high temperatures but they turn a bit more consistent into the beginning of February. 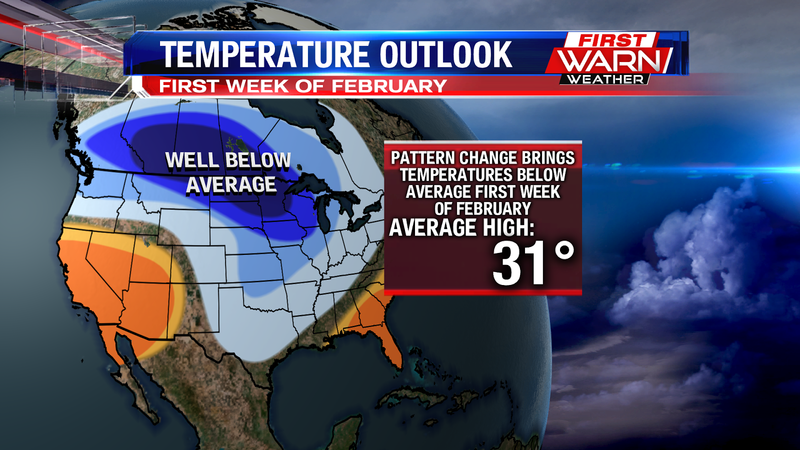 A pattern change into the first week of February will drop temperatures below average through that time. Upper level jet winds will build to a ridge over the West Coast and up near the Gulf of Alaska . This will force colder arctic air south through them middle of the county. The core of the cold will be focused over southern Canada and the northern Plains, but the cold will still extend south covering most of the country. Only the southern coasts will be above average during that time. The average high around the beginning of February is 31°. Southwest winds increase Friday afternoon ahead of a cold front that will bring temperatures back down into the 30's by Sunday afternoon. High pressure that helped clear our skies Thursday afternoon will continue to slide into the southeast. Low pressure will move through southern Canada pulling a warm front through late Thursday night. The difference in pressure between the high in the southeast and the low in southern Canada will cause winds to increase Friday afternoon, gusting up to 35 mph. 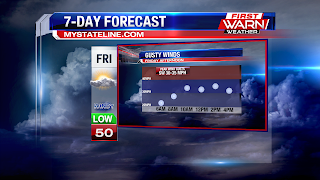 The southwest wind, however, does bring afternoon temperatures up near 50 degrees Friday! Friday night will be mild with a small chance for a passing sprinkle or light shower. Temperatures on Saturday will warm back into the mid 40's, but a secondary cold front Saturday night will bring temperatures down into the low 30's by Sunday afternoon. The latest drought monitor was released by the National Drought Mitigation Center Thursday morning. There's been very little change in the abnormally dry conditions in northern Illinois and southern Wisconsin, but an expansion of moderate drought conditions over southeast Iowa. Rain was in abundance earlier in the week with many receiving anywhere between one and two inches between Sunday night and Monday evening. Precipitation for the month of January is above average by 0.22 inches, but for the winter season is below average by 1.27 inches. Snowfall for the month of January is below average by 2.2 inches, and almost 9 inches below average for the winter season. The recent rain and rapid fluctuation of temperatures recently has caused some concern for possible ice jam flooding along some of the local rivers. 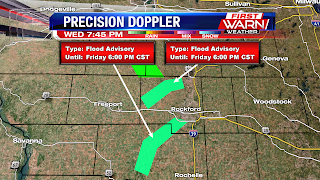 A Flood Advisory remains in effect for the Rock River at Byron and for the Pecatonica River near Shirland through Friday evening. Current stage of the Rock River at Byron was 10.2 feet and ice affected. Action stage is 10.5 feet and flood stage is 13 feet. Current forecast for the Rock River is to rise near 'action stage', or near 10.5 feet by Thursday morning. Current stage of the Pecatonica River at Shirland is 9.9 feet and was ice affected. Action stage is 11 feet and flood stage is 12 feet. 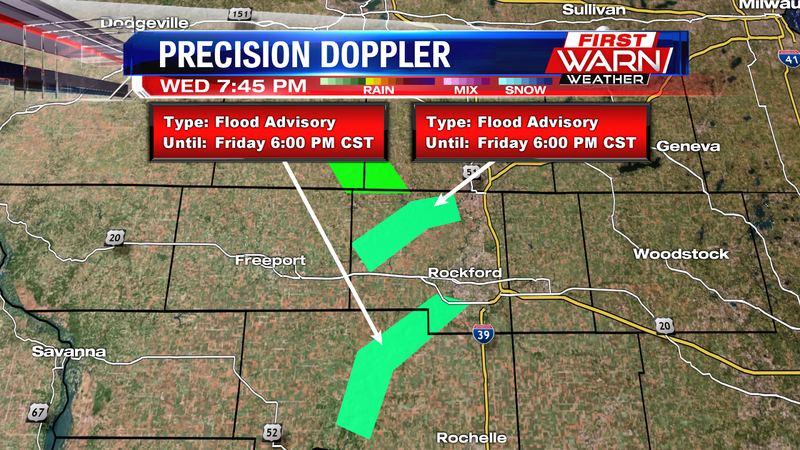 Current forecast for the Pecatonica River is to rise near 'action stage', or near 11 feet by Friday morning. Ice jam cause river levels to quickly fluctuate with very little warning. The ice jams typically form along bends within the river or where ice can become stuck as it flows downstream. When an ice jam occurs, flooding occurs upstream of the jam as the water becomes 'backed up'. Once the ice jam breaks free flooding may then occur downstream due to the rapid rush of water. Residents living in low lying, flood prone areas need to remain alert for the potential of flooding due to ice jams. 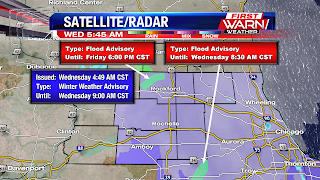 A Winter Weather Advisory has been issued for Winnebago, Boone, McHenry, Ogle, Lee, and DeKalb counties through 9am. Areas of patchy freezing drizzle are mixing in with flurries this morning, creating areas of black ice on untreated roads. The freezing drizzle and glaze of ice has been more concentrated near the Chicago area and it's suburbs. 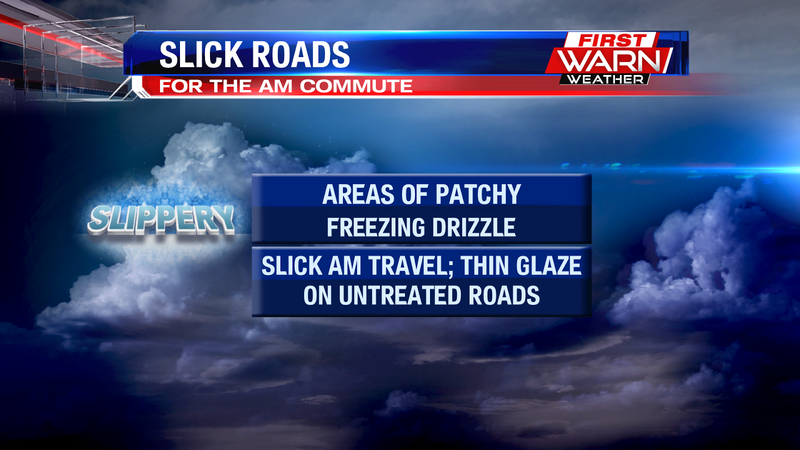 But still poses a slick commute for many of us across the Stateline. 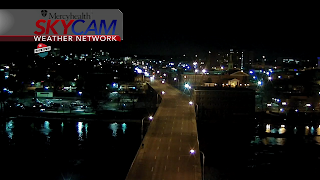 Take it slow this morning and use caution while driving, but also on sidewalks, parking lots and bridges where a glaze of ice will still be possible. As we know, its very difficult to see black ice until you're on it, so take it slow through the morning. 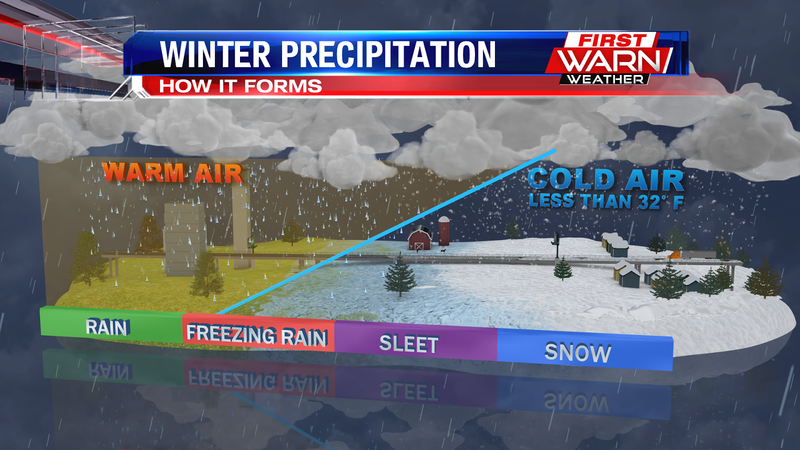 The formation of freezing drizzle is all based on the thermal profile in the atmosphere. When the atmosphere all the way up is warm, well the precipitation falls as rain. When you get warm air aloft, and a shallow freezing layer then the precipitation melts and falls as rain, but then refreezes on contact with the freezing surface. This then creates a glaze of ice on untreated roads. 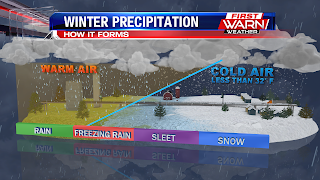 When the atmosphere has an upper level layer of warm air, but also a fairly deep cold layer the frozen precipitation falls from the clouds, melting through the warm layer, and then refreezes before hitting the surface. Finally, when the atmosphere is all cold, then we get snow. Temperatures were a little different than yesterday only hitting the low 30's this afternoon, as opposed to the whopping 54° we hit yesterday. The good news.....these colder temperatures aren't here for too long, and the 50's will return before you know it. As we go through the rest of the night we'll hang on to the cloud cover, which will keep our temperatures from cooling down too much, only to the low 20's tonight. By 6am, we'll start to see some flurries move through our area, but they won't last long and will clear out by around 9am. Once we hit the afternoon, we'll see a gradual clearing, getting some sunshine before sundown. Highs will be around 34°. 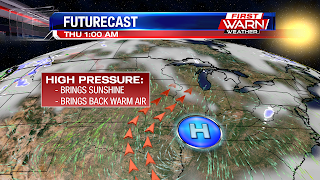 Once we reach Wednesday evening, a high pressure system will track in from the southwest. This will bring some dry, warm air into our, initiating our next warmup and bringing us some sunshine to go along with it! 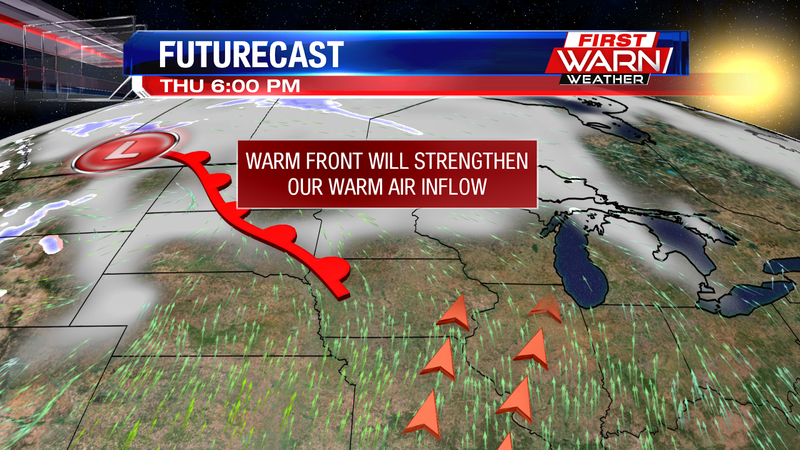 Once we get to Thursday evening, a warm front will move near our area. 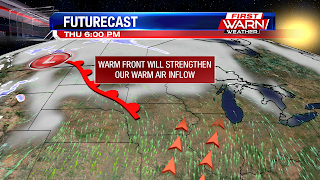 Even though it won't move directly through our area, it'll still help strengthen that warm air inflow, bringing us into the low 50's by Friday afternoon. That low pressure system will move in Saturday night, and we may see a few flurries during the overnight, but other than that things look to stay dry this weekend. The warmup will sadly come to an end on Sunday, when we cool back down to the 30's again by the time we end the weekend. After that, temperatures will warm to the low 40's by the middle of next week, with chances for showers on Tuesday. 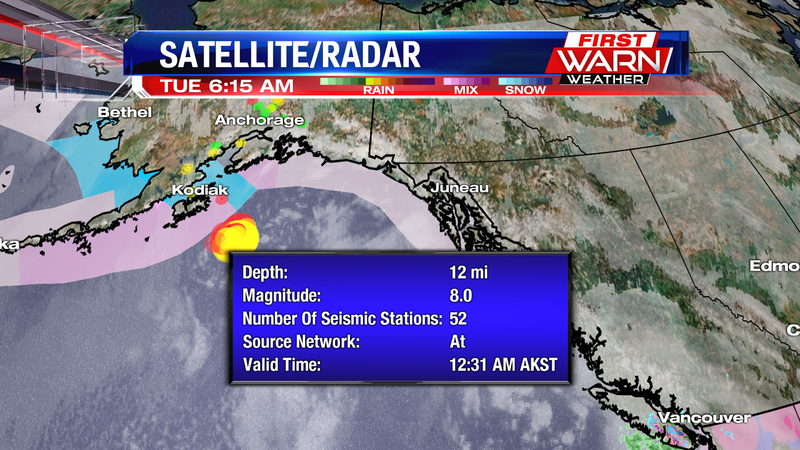 A strong 7.9 magnitude earthquake was recorded around 3:30am central time this morning, just southeast (280 km) off Kodiak Island, Alaska. The strong earthquake occurred because of the strike slip faulting, according to to the USGS. 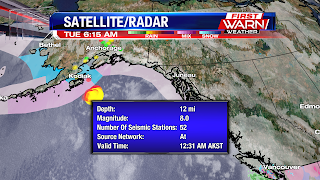 This prompted Tsunami Warnings and Watches across the Alaskan peninsula, south along the west coast of Canada, and along the entire west coast of the United States. Even Hawaii was on alert this morning. Now, the Warnings and Watches associated with this earthquake have been cancelled, as only smaller tsunami waves were recorded. 10:45pm Update: The transition over to snow has begun north of the state line where Madison had already received close to an inch of snow. 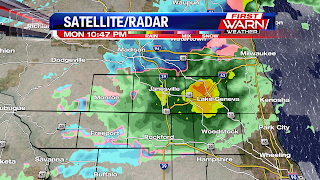 Low pressure is now passing through northern Illinois, with a few showers lifting up north into southern Wisconsin. But as the colder air becomes wrapped in behind the low, the transition over to a rain/snow mix, before eventually switching over to all snow will take place. We can already begin to see that transition now over parts of NW Illinois. So far there are no reports of snow reaching the ground locally, but I wouldn't be surprised to begin to see the snow develop between Midnight and 2am. 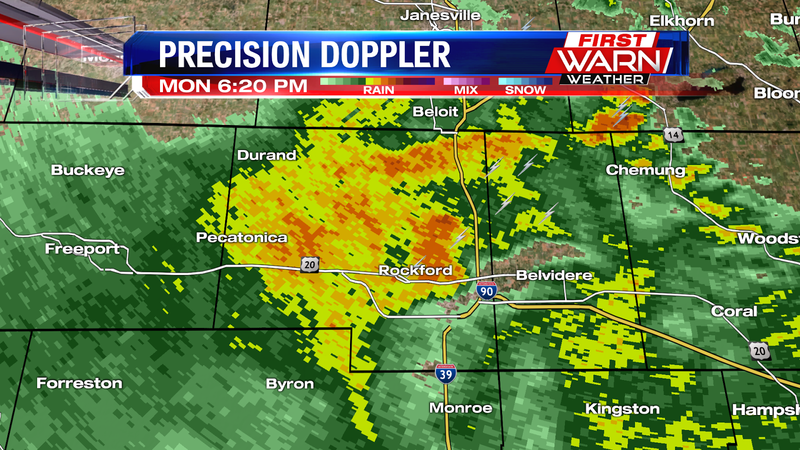 6:20pm Update: Moderate to heavy rain continues to fall over much of Winnebago County Monday evening. 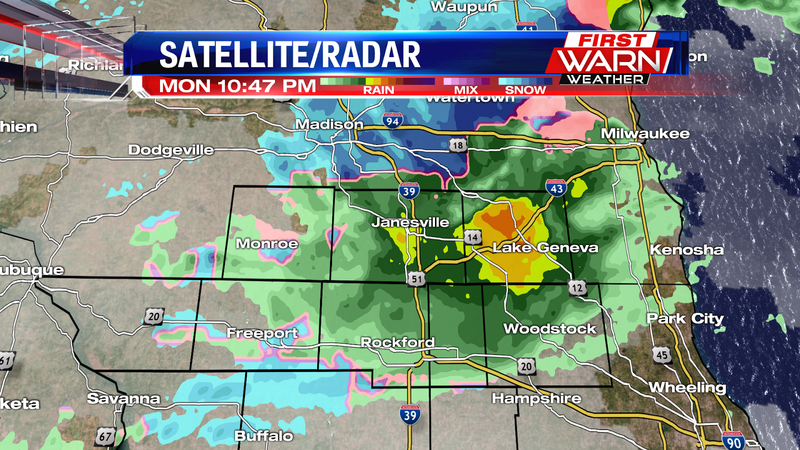 The threat for hail has gone down, but the heavy rain threat remains. 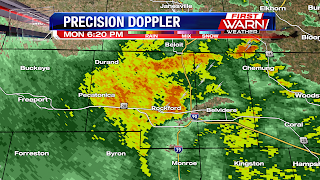 The rain should begin to lighten up between 7pm and 9pm, with scattered showers through Midnight. 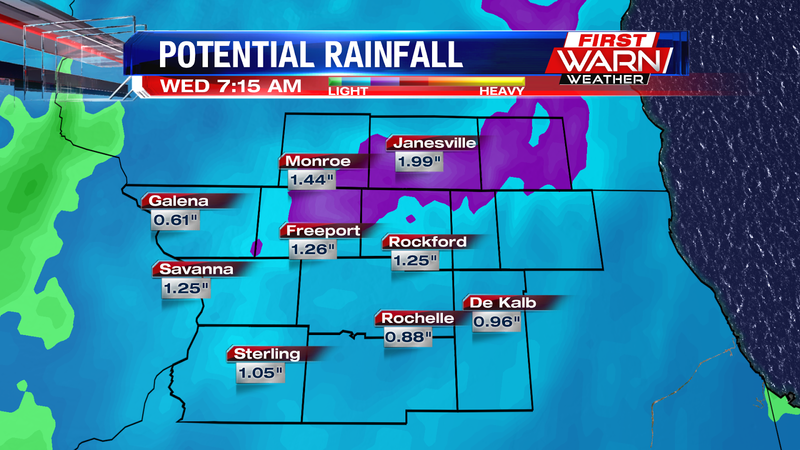 Localized flooding is possible with this additional rainfall as totals add up to, and surpass an inch of rain. (5:21:37 PM) nwsbot: Local Storm Report by NWS LOT: Malta [De Kalb Co, IL] trained spotter reports HAIL of penny size (M0.75 INCH) at 04:52 PM CST -- most hail stones were pea-sized, but a couple larger hail stones were penny-sized. Skies cleared following the heavy rainfall Monday morning, allowing instability to build during the afternoon. 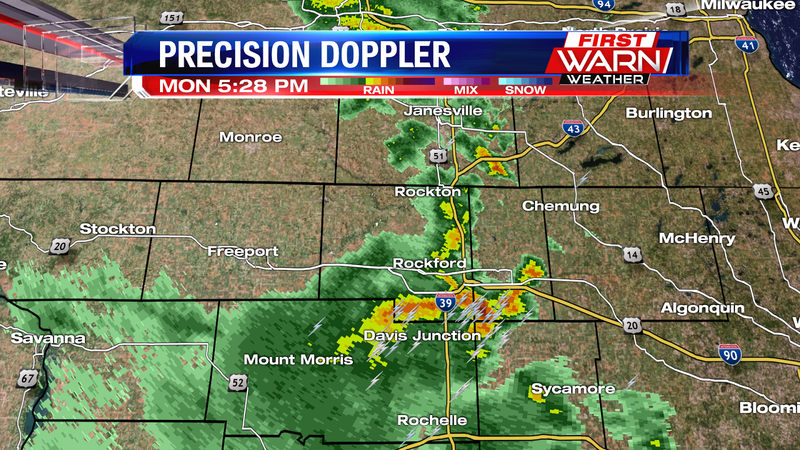 Thunderstorms were quick to develop over central Illinois, some of them turning severe, as low pressure moved through Iowa. Scattered thunderstorms, some strong enough to produce pea to nickel sized hail, will continue to lift up through Highway 20 and eventually into southern Wisconsin by Monday evening. These thunderstorms are moving into an environment with a little less instability than what they initially developed in, but the wind shear is strong enough to sustain the storms for the next couple of hours. Hail and heavy rainfall will be the greatest threats with these storms. As you read in the previous post, areas of rain and even a few storms will be possible today. 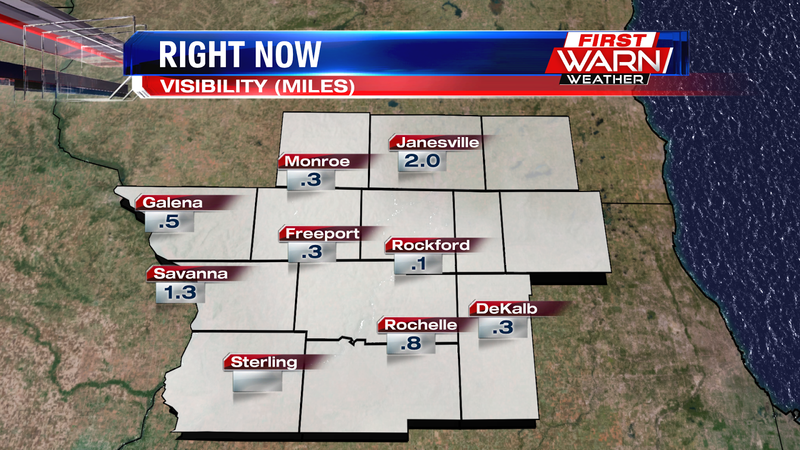 This morning the Dense Fog Advisory has cancelled early because of improving conditions in the fog due to the rain. However there will still be times of low visibility due to periods of moderate to heavy rain through the morning. 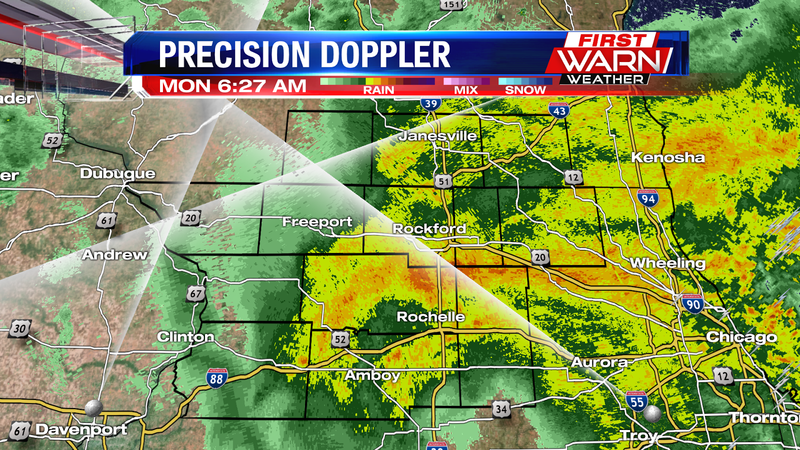 Moderate rain over the Rockford area will continue to lift to the northeast through the morning. Expect the rain through the late morning, before the dry slot moves across northern Illinois. 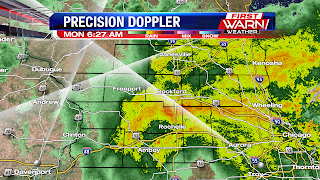 This will bring an end to the rain for a time, before more rain and even thunder will be possible this afternoon. 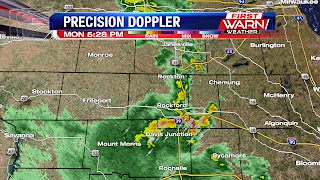 Right now, the area with the higher threat for shower and even storm development looks to be near Rockford and areas east. This is where models are showing redevelopment of rain and storms this afternoon. Watch for a bit of clearing around the lunch time hour as the dry slot will bring a bit of sunshine. 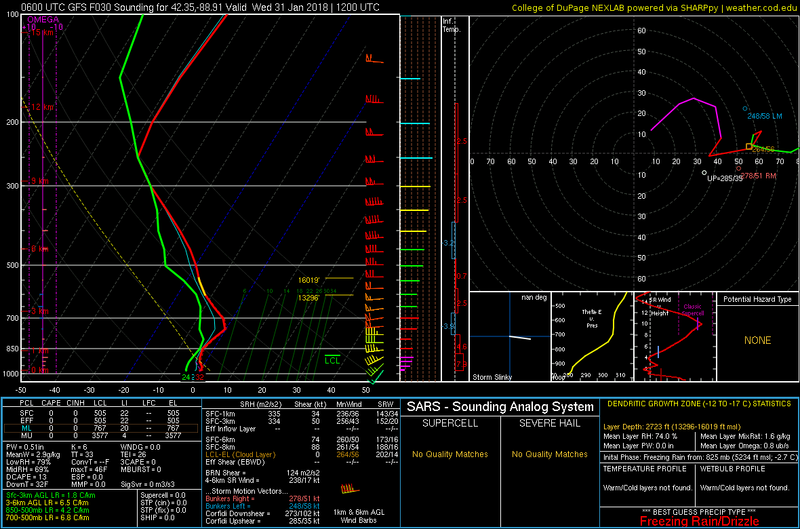 This, along with the approaching low will generate a bit more instability. As instability grows, its possible for storms to develop. The Storm Prediction Center has shifted the Marginal risk to include most of northern Illinois. It's possible for a few strong to isolated severe storms across the Stateline this afternoon. When it's all said and done, over an inch of rain is possible! Higher totals can even be found in those areas that see the storms later this afternoon. 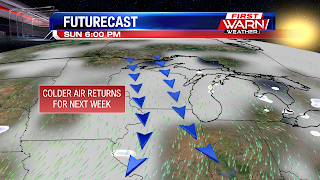 A very moisture rich air mass will be pulled northward Sunday night, bringing with it a threat for heavy rainfall as far north as central Wisconsin. Drizzle and light showers continue Sunday evening ahead of a warm front that stretches from near the Iowa/Missouri border into western Illinois and south of Romeoville. North of the front temperatures are just shy of 40 degrees, but south of the warm front temperatures are in the upper 40's to mid 50's. Dew point temperatures are also fairly high reaching 50 degrees as well! That's an extremely high dew point temperature for mid-January! The warm front will continue to lift northward through the overnight Sunday, most likely reaching northern Illinois mid-day Monday. Temperatures won't get quite as warm as what they are to the south, but highs could spike close to 50 degrees following the rain Monday morning. Rain showers are beginning to increase in coverage to the southwest, ahead of an approaching mid level low pressure system - or what we refer to as a 'shortwave'. This shortwave will help push the front northward, but also allow the showers now over Missouri and Arkansas to continue to expand northeast. The overall coverage of the rain will increase over northern Illinois around Midnight, lasting through early Monday morning. Strong winds in the lowest level of the atmosphere will also help sustain rain, and even bring a little elevated instability northward. This increases the chance for a thunderstorm or two by Monday morning. 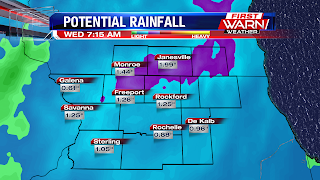 Rainfall totals could be close to an inch, and possibly higher with any thunderstorms, by Monday evening! 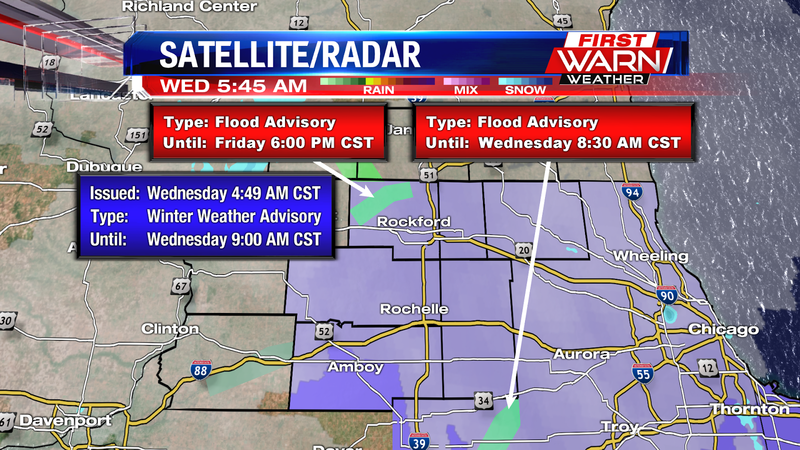 Localized and minor flooding is possible as the ground is still frozen. 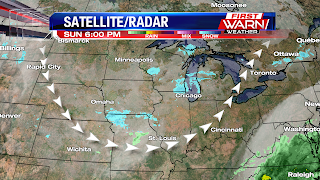 Low pressure will move closer to central Illinois by Monday afternoon. 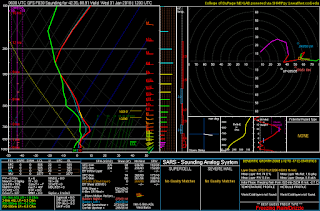 As it does, there could be enough instability to produce a couple stronger thunderstorms over parts of western and central Illinois early Monday afternoon. 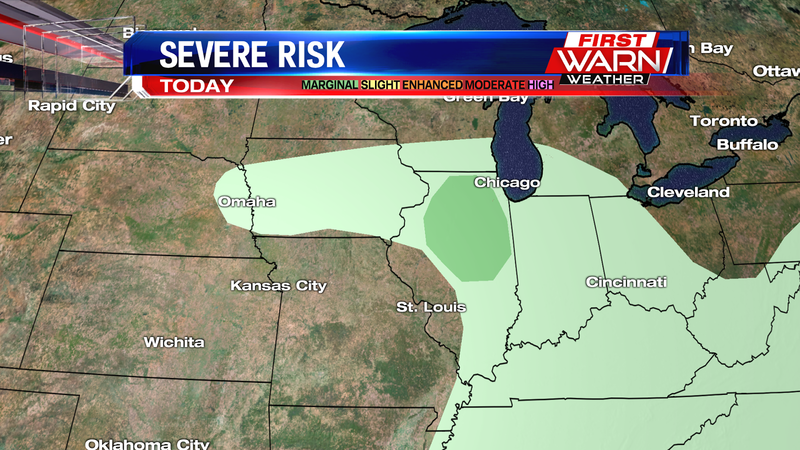 The Storm Prediction Center does have that area highlighted with a 'marginal' risk for strong thunderstorms Monday. 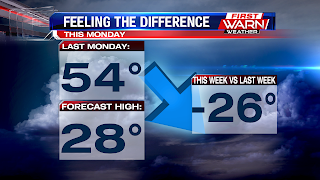 The cold front passes Monday evening with temperatures falling below freezing by Monday night. Most of the moisture will be gone, but there may be enough lift in the atmosphere to allow for a slushy accumulation of snow Monday night into Tuesday morning. 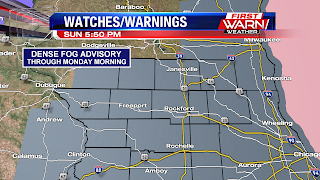 A Dense Fog Advisory has been issued for all of northern Illinois and southern Wisconsin through Monday as visibility has fallen to only a couple hundred feet in some locations. 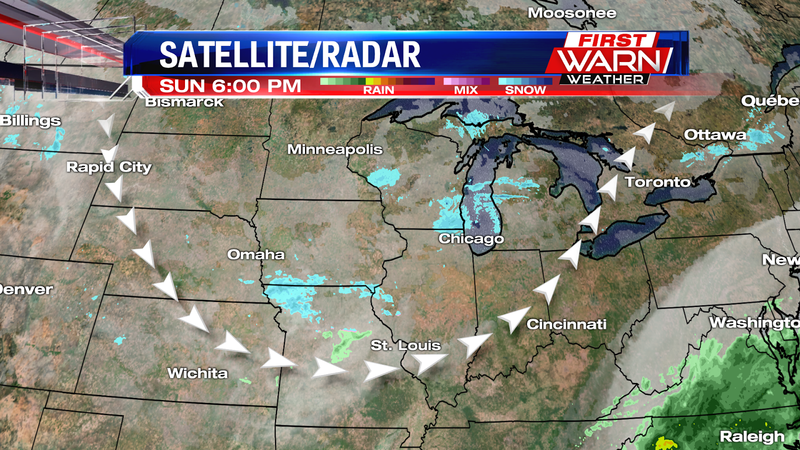 Moisture continues to be pulled in from the south this afternoon as a warm front lifts through central Illinois. 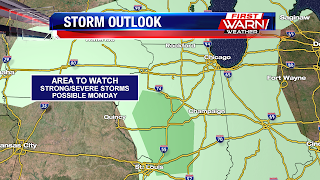 This warm front will move into northern Illinois Monday morning bringing with it bouts of heavier rainfall, and even the possibly of a thunderstorm or two. 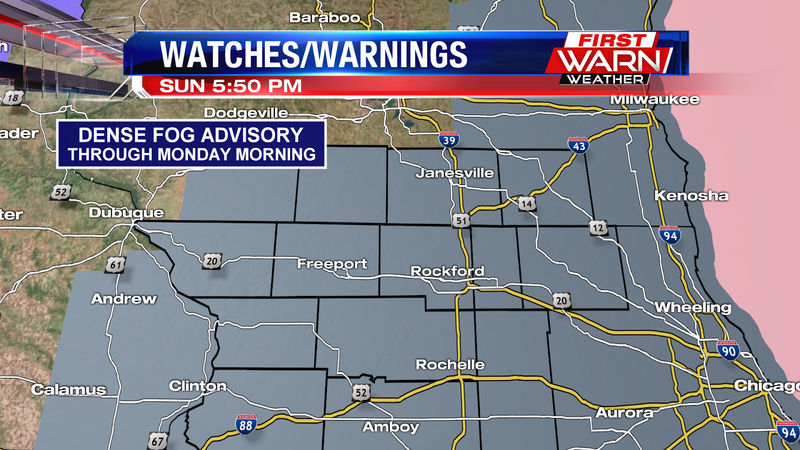 Visibility may improve once the rain begins to move in, which should be after 9pm Sunday evening. Although we will see some drizzle and even a couple of light showers throughout the evening. 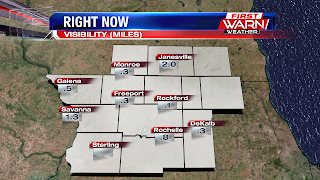 Take it slow now that the sun has set this evening, as quickly changing visibility is very well possible. 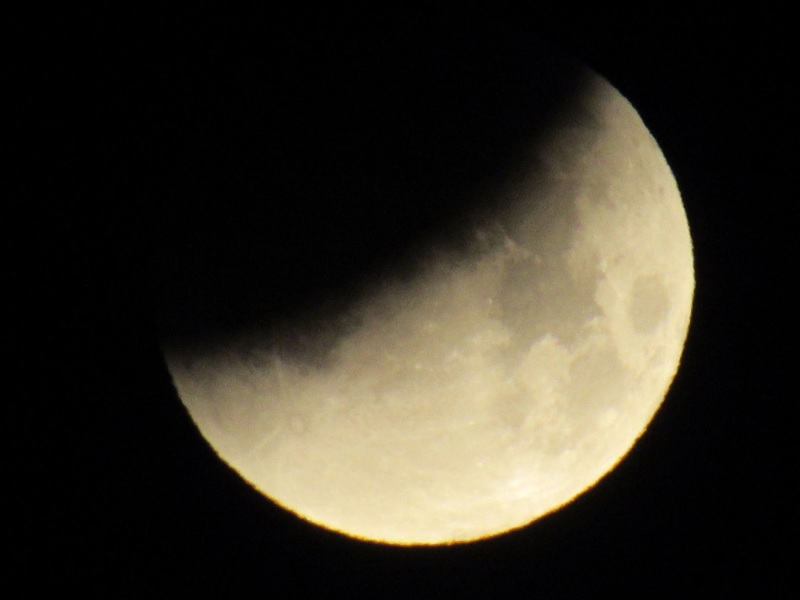 Did You See It This Morning?! 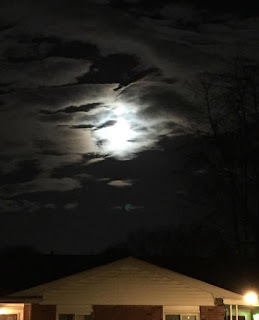 Arctic Blast Nearing Its End? !